taking weekly trips to Chicago to study with members of the city’s chamber music society. Seeing her promise, the people of Aurora in 1881 helped Powell’s family fund a year of study in Leipzig, Germany. Powell then continued her musical education at the Paris Conservatory. She later maintained that in Germany she learned to be a musician, while in France she learned to be an artist. 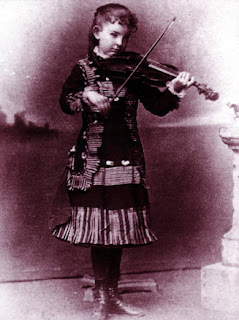 In 1883, at 15, Powell embarked on an extended concert tour in England, where she played for the royal family. After another year of instruction in Germany, she performed with the Berlin Philharmonic in 1885. Later the same year, she made her American debut with the New York Philharmonic Society. Courted by an artist’s manager, Powell contracted to tour throughout the American West in 1887. Playing in venues large and small, she introduced her audiences to many violin masterworks then virtually unknown in the United States. In an era when few women were professional musicians, Powell also promoted other female concert performers and female composers. She set forth her views in a paper titled “Women and Music,” which she elivered at the 1893 Chicago World’s Fair. In 1894 Powell made history by being the first woman to lead male musicians in a chamber ensemble. Known as the Maud Powell Quartet, her string ensemble embarked on a series of tours after making their debut at New York City’s Carnegie Hall. The same year, Powell made another historic first by becoming the earliest musician to record with the Victor Talking Machine Company’s Red Seal label. By 1919, she had had more than 70 recordings made of her performances. After the Maud Powell Quartet disbanded in 1898, Powell performed throughout the world, returning each year for a tour of the United States. In 1904 she married H. Godfrey Turner, a concert manager who took control of her professional affairs. Throughout the rest of her life, Powell maintained a relentless concert schedule that often took her to schools, colleges, and other unconventional venues for concert performances. The rigorous schedule exhausted her, and Powell’s health began to suffer. On January 8, 1920, she died of a heart attack at the age of 51. During her lifetime, she had successfully dispelled conventional wisdom by proving that both an American and a woman could possess the talent to become a world-class classical musician. Karpf, Juanita. “Powell, Maud.” In American National Biography, edited by John Arthur Garraty and Mark C. Carnes, vol. 17, pp. 781–782. New York: Oxford University Press, 1999. 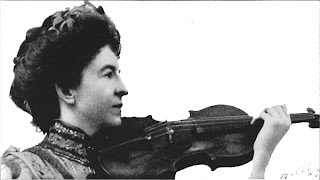 Shaffer, Karen A. Maud Powell: Pioneer American Violinist. Ames: Iowa State University Press, 1988. The Recorded Violin, Vol. 1: The History of the Violin on Record. Pearl, CD set, 1993. Great Violinists, Vol. 1. Pearl-Koch, CD, 1992.